Manali is many things at once; a romantic idyll for honeymooners, a treasure trove of adventure for thrill seekers and a cool, pleasant escape from the blistering temperatures of the Indian plains. This resort town is one of the most prominent hill stations of Himachal Pradesh. It is, in fact, one of the few hill stations of our country that never sees an off-season. No matter which time of the year it is, there is a constant inflow of tourists here. Some people come to enjoy the snow while others come looking for an escape from the scorching heat of the plains. There is really no direct answer to the question of the best time to visit Manali because it entirely depends upon a person’s reason to visit; and will be different for anyone. Located just 550 odd kilometers north of New Delhi, Manali’s importance in the scheme of things dates back centuries. In ancient times, it was a tiny village which marked the beginning of a critical trade route. It connected the hinterlands of the Indian subcontinent to Ladakh and twined further through the Karakoram Pass and ended in the Tarim Basin, in what is now extreme North West of China. In fact, Manali was known as the “end of the hospitable world”! Can you imagine how many travellers have passed through these misty meadows and picturesque valleys? Today, this once secluded haven is a busy town with all the tourist amenities – hotels, home-stays, restaurants and cafes. 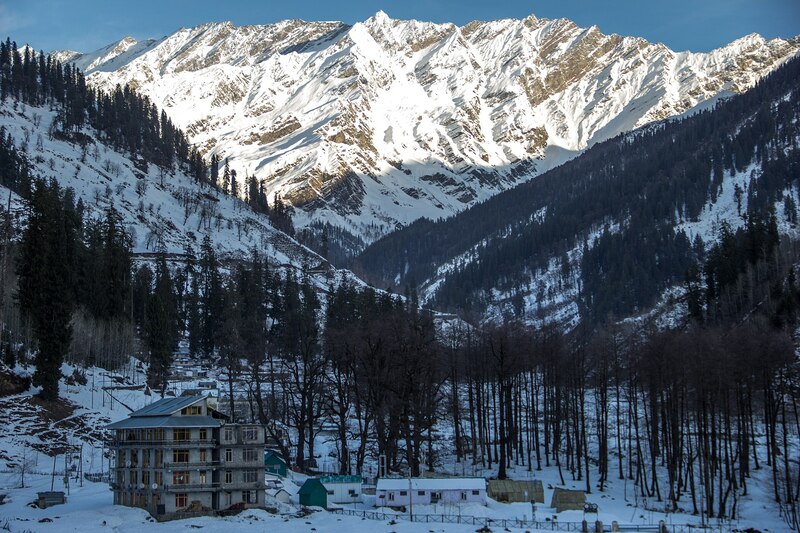 The months of January and February in Manali can truly be termed as the months of the white. This is really an ideal time to enjoy some snowfall and witness the spectacular beauty of this place in white. With that being said, weather at this time does get extremely cold and temperature at night will definitely go below zero. Snow starts to melt in March and is mostly all gone from lower areas by end of the month. Spring arrives in April and the weather turns pleasant with clear views and sunny skies. Rohtang Pass opens in May and river rafting too at this time is in full swing. The months of April, May and June is when Manali receives majority of its share of tourists. Monsoon arrives towards Late June and the months of July and August are termed as a bad time for planning trip here. This entire region receives a lot of rain each year; sometimes enough to cause landslides and block roads. Incessant rains can sometimes keep you indoors at the hotel throughout the duration of your trip and ruin all the fun. Monsoon departs by September but leaves plenty of greenery behind for you to enjoy in this month. This is a good time to catch lush green vistas all around. October is the time for autumn and all that was green in September turns golden Orange in October. This is another good time to visit for photography enthusiasts or for someone wanting to visit Manali at a less crowded time. The months of November and December are not generally considered to be a good time because the scenery is a bit dull and dry. Rohtang Pass will be closed, weather will be extremely cold and there won’t even be any snow around. Temperature of Manali fluctuates highly from a freezing 0 Degrees Celsius in winter to a hot 35 degrees Celsius in Summer. But for most part of the year, it remains to be on a pleasant side. CLet me break this information down month by month. The average temperature in January remains to be 3°C minimum and 15°C maximum. At night, it will definitely fall down below zero. Chances of snowfall remain high throughout the month making it a great time to visit for catching some snow and indulging in winter sports. Temperature in February remains around the same as January but snow on the ground is a bit more in earlier part of February. It is another great month to visit to find some snow. Average minimum temperature in March rises to 5 °C and maximum temperature hovers at around 20 °C at noon. Weather starts to turn warm and pleasant towards end of the month. April is a perfect time to be in Manali. The average temperature will be around 10 °C minimum and 25 °C maximum. If you were lucky, you may find some snow still in Solang Valley if you went in early part of the month. April also marks the beginning of tourist season in Manali. This is the time when Manali starts to feel crowded. With vacations on in schools, a lot of people visit Manali in May and June with their families. Rohtang Pass too gets declared open in May. The average temperature will be 14 °C minimum and 35 °C. During Day, even Manali would start to feel hot in May and June. Trust me, during one of my trips there in June; we had to switch on the AC in the room. Average minimum temperature will be around 17 °C and maximum around 38 °C. Towards end of June, the region may receive some pre-monsoon showers. July is the time of Monsoon and it is truly the wet season in Manali. It can rain anytime and sometimes it rains non-stop all day long. Roadblocks caused by landslides are a common sight in the Himalayas in Monsoon and the same can happen in Manali as well. Average temperature will remain around 20 °C minimum and 32 °C maximum. While the rains will continue to be a problem in August as well, it really brings the hills to life with flora and fauns. It will be lush green vistas all around and a photographer’s delight. Average temperature will be around 15 °C minimum and 30 °C maximum. September offers all that the monsoon season does but without the risk of any rain. Monsoon would be all gone but there will still be plenty of greenery left behind. Average temperature in September in Manali will be 17 °C minimum and 30 °C maximum. Things get cold in October as winter starts to settle in. The temperature will drop down to around 10 °C minimum and 25 °C maximum. Autumn season arrives in October and all that was green in September will not turn in to Orange. November is officially the winter season and in many ways a bad time to visit Manali. Average temperature will fall further down to 5 °C minimum and 20 °C maximum. The scenery will be dull, dry and a little boring in this month. Rohtang Pass too will get declared closed in November. Average temperature in Manali in December is 3 °C minimum and 15 °C maximum. It starts to snow in lower areas of Manali and Solang only towards the end of the month. If you are someone who doesn’t like crowded places then you may want to avoid May and June. If cold is not your thing, then do not go between December to March. July and August are generally thought to be a bad time due to rains but it is the best time to go if you want to see lush green vistas. If photography is your thing then you should avoid November and December because the vistas will be very boring at this time. Why should Manali be on your travel wish list? Perched more than 2000 metres above sea level in the Kullu Valley, Manali town is spread out along the crystal clear waters of the Beas River. The town hums with activity: Kulluites, Tibetans, Nepalis, Buddhist Monks and Zanskaris go about their business in their traditional, bright, colorful clothes. Just walking through the Mall Road will give you an intimate look at a cross-section of fascinating people! Add in the Indian and foreign travellers and you can behold riveting chaos! In the Valley, around every turn lies an opportunity for sightseeing. Adventure enthusiasts can ski, hike, rock climb, kayak, raft, paraglide or climb mountains. Manali is an intriguing mix of peace and adventure. Manali is also high on religious significance and abounds in ancient temples, which has earned it the moniker – “The Valley of the Gods”. Surrounding the town are sky high mountains draped in thick snow and deep gorges. The deep, mysterious woods are fragrant with the scent of Alpine flowers and thrumming with bird songs. Long walks through the scenery are perfect for meditation, while you will happen upon apple orchards and still hamlets. Manali is a splendid tourist destination throughout the year. Let us explore some of the places you will see here and activities that you can be a part of depending upon your time of arrival. Manali in this season has bright, charming days and cool, pleasant nights. The forests and valleys brim over with life after the freezing winter. Flowers in full bloom and lush greenery can bewitch even the most jaded traveller. There is much to do and see: you can go trekking, river rafting, paragliding and camping in Solang Valley or Raison. Let us look over all the exciting adventures awaiting you. The Beas River is blessed with some of the most serpentine rapids. White water rafting over these rushing, treacherous waters is quite a challenge. It is sure to get your adrenaline pumping! The best place to try is at Jhidi or Pirdi in the month of June, when the rivers and streams are boosted by fresh snowmelt. Glide across this mountain paradise on a majestic glider and view unreal, unending vistas of natural beauty. But be warned! Taking the leap requires you to pool all your courage together! The life-changing experience is definitely worth the initial scare. You can spend from 90 seconds up to 30 minutes up in the air on a bright sunny day. Marhi and Solang Valle, not far from Manali are the best places to for takeoff. Slower in pace but no less enriching is hiking across vast landscapes of peerless beauty. Amateurs can begin with a day-long trek, while more seasoned trekkers can go for longer duration treks into higher altitudes and rugged terrain. This also provides the opportunity of camping in the great outdoors under a star-speckled sky, far away from urban light pollution. Are you confident about your stamina and grit? Sure you have excellent hand-eye coordination? If the answer is yes, you may swoop across punishing terrain on your mountain bike! Mountain biking in Manali is the ultimate adrenaline rush! The most popular biking trail extends from Manali to Rohtang Pass to Baralacha La Pass to Lachalangla Pass to Tanglang La to Khardung La and back to Manali. Manali offers prime opportunities for mountain climbing, for both beginners and experienced climbers. If you have always wondered about how you would fare in mountaineering, Manali is your answer. Not only will you get equipment but also lessons and instructors to get you started right. Avoid Manali during this time. Do not be lured by dirt cheap hotel prices. Torrential rains lash the slopes, leading to major landslides and roads blockage. Places to visit: Great Himalayan National Park, Arjun Gufa, Jogini Waterfall, Nehru Kund, Chandratal Baralacha Lake, Manali Sanctuary, Rohtang Pass, Manali Zoo, Indrasan Peak, Manu Temple, Jagannath Temple and many more. You can ski over miles of thick, fresh snow under a blazing blue sky. Plenty of instructors are available if you are a newcomer to skiing who teach you the methods and safety precautions of this sport. Some of the most perfect skiing locations around Manali are at Gulaba, Dhundi, Rohtang Pass, Marhi and Solang Valley. Experienced skiers can go for cross country skiing as well. Several National level competitions are held during this time. This is a relatively new addition to Manali’s cache of winter sports. Freestyle and daring, snowboarding is ideal for an exciting swoop through the snow. Change direction at sharp angles and land with elan! Again, instructors will be on hand to take you through the process. Soon you’ll zip and zoom over the snow-clad slopes all by yourself! Once you begin, you’ll find it hard to stop! Are you ready to take your skiing up to the next level? Now you can get a helicopter to drop you off on a high mountain. From there, you can ski down the glorious, snowy slopes! Manali offers some incomparable opportunities for heli-skiing at Rohtang Pass, Chanderkhani Pass, Deo Tibba and Hanuman Tibba. A fun-filled group activity, you can sledge down mountain slopes on a wooden sledge with your family and friends. Rohtang Pass and Solang Valley offer exceptional sledging areas with plenty of thrilling twists and surprising turns to challenge you. Prepare to be enthralled with a God’s eye view of Manali in winter – from a cable car suspended miles above the ground! The mesmerizing view of snow-draped valleys and imposing Himalayan peaks complete this breathtaking ride. If you are lucky, you might experience fresh snowfall while on the ride. Can anything be more romantic? If you visit during February, be sure to attend this mind-blowing festival. Plays, folk dances, folk music and food fests celebrate Himachal’s stunning culture. There are also competitions galore including a beauty contest! The fresh snowfall also invites throngs of winter sports competitors. Climbing up on icy slopes and frozen waterfalls is as daring as it sounds – you need nerves of steel! Manali is surrounded by glaciers superb for anyone wishing to test their skills. Just make sure you are fit and are kitted out with proper equipment. This is one of the most dangerous winter sports there is. Always remember to have trained guides along and never attempt ice climbing alone. All of us have admired the Olympic ice skaters at some point or the other – weaving gracefully over the snow. Manali is the place to try your luck at this exquisite and fun sport. Rohtang Pass is the place to be to try your luck over frozen ice sheets. In conclusion, there is no best time to visit Manali. The best time is whenever you decide to set off! Come and experience the best season to visit Manali for yourself! I hope the information above was of help. If you have any questions; or need any other details; please feel free to ask in the comments section below; or at our Community Forum; and I will be glad to answer.